The limestone-heavy soils of Serralunga d’Alba are known for providing the most long-lived and full-bodied Barolos. Porro’s vineyards are located here in the Lazzarito cru, a gorgeous amphitheatre that faces south-southwest and offers the grapes full sun exposure and protection from the wind. The sub-zones of Lazzairascoand Santa Caterina are both monopoli and share the same soil; however, different exposition and altitude bring distinct traits to each wine. Lazzairasco, a very hot site home to Guido’s oldest Nebbiolo, gives a more powerful, masculine wine, while the cooler, breezier Santa Caterina brings out the delicacy and elegance of Nebbiolo. 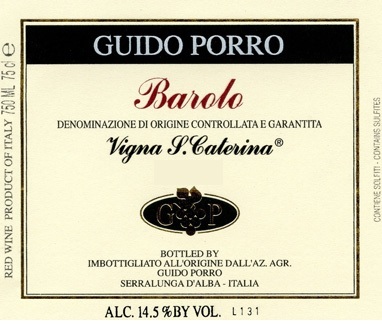 Even Porro’s Barbera, a grape that is usually planted in lesser vineyards, enjoys a privileged place inSanta Caterina. Guido sticks to traditional methods in the vineyards and cellar, and he never gets in the way of the grapes’ natural expression.